For many Americans, our fondest childhood memories were those mid-summer encounters with the generally brown & white signs that augured the imminent approach of a national park, the fabled Yellowstone, Yosemite, Everglades or Grand Canyon national parks, and so many other spectacular repositories of America's natural, cultural and historic heritage. The excitement we felt on such an ocassion is easy to recall - we've entered a special place, stepped onto hallowed ground, encountered mesmerizing vistas, explored wild and remote terrain. Whether you're a culture vulture or a greenblood, the 406 units of the U.S. national park system, administered by the U.S. National Park Service (NPS), offer a broad and deep selection of the American experience. This page is a collaborative effort, which began with my initial cache of 30+ images, but so generously endowed since by a treasure trove of images by professional colleagues and many new acquaintances. Regardless of the source, for the first time anywhere, we may now get a sense from these amazing and diverse entrance signs of that same excitement that struck those of us who sought out America's Best Idea - the national parks. With the centennial of the NPS just nine years away, now is as good a time as any to rediscover and relive that childhood thrill. The newest unit signs added are of Charles Young Buffalo Soldier and better images for the new signs at Hagerman Fossil, Minidoka & New Bedford Whaling. I have a picture of Roosevelt Campobello International Historic Site if it qualifies for this site. It is co-managed by the NPS along with Parks Canada. I love these. What a wonderful idea for a photo collection. Thanks for posting! Sorry for my absence the past year or so. Some answers... For Mark, I've been in Kobuk Valley, Noatak & Cape Krusenstern, also, but since there are no roads to these remote NW Alaska NPS units, there are no entrance signs, as far as I know. Julie - Yes, I'd love to have a photo of the sign you made for KOVA and for PINN! I have signs from two parks you are missing. Both are sites which the NPS is a partner in, but not the managing partner. As a result, their logo does not appear on the signs. Nevertheless, they are national parks. They are: Touro Synagogue, Newport, Rhode Island, and Augusta Canal National Heritage Area, Augusta, Georgia. In addition, the sign you have for New Bedford Whaling, New Bedford, Massachusetts, is just a banner. I have an actual sign, and an exceptionally beautiful one. If you would like any or all of these shots, please let me know how to send them. Additional information for the typeface question: The NPS used Futura in the 1950s and 60s (Dinosaur, Big Bend, Natural Bridges), before Clarendon took over in the 70s. I would still love to know though what the two early 30s and 40s styles were (Shenandoah, Tumacacori, Scotts Bluff, on the one hand, and Tonto, Theodore Roosevelt, Sequoia on the other). I need a picture of the Kobuk Valley sign. When we were there we never saw a sign. I have a pictures of Agua Fria and Sonoran Desert National Monument signs from recent visits. They are located *REALLY* off the beaten path. Probably have some others you're missing...we've been to every National Park and most National Monuments. There is a new sign for the Korean Veteran's Memorial. What would be the best way to add? Not sure if there are any more signs out there that need to be added here. Been 4 years since I created this gallery. Those large Alaskan parks remain without signs, to my knowledge. My apologies... I was looking under "S" instead of "G." I found it...thanks. Hmm, unless I missed it, I don't see a entrance sign picture of one of America's most visited National Parks...Great Smoky Mountains(?). I don't have one avaliable on computer, otherwise, I'd send it. Might want one?? I love this site! I am a former seasonal ranger with the NPS, and have always enjoyed taking pictures of the park service entrance signs. Awesome!! Jeff - When I visited the NPS Western Arctic Parklands office in Kotzbue, AK a few years back I learned that there are no ROADS even into Kobuk Valley, Noatak or Cape Krusenstern, and thus, no entrance sign for those three NPS units. I didn't see a sign to Kobuk Valley National Park in Alaska. Has anyone ever been there or is there even a sign? Some NPS units do in fact have truly second-rate entrance signs. The signs for Fredericksburg and Spotsylvania National Military Park never coherently have the full name of the park in any prominent way. Even the sign here displays more prominently "Fredericksburg Battlefield." Its choice as the "entrance sign" is a somewhat arbitrary. The sign for the Chancellorsville Visitors Center in the same park is probably nicer (I'd be happy to send my photo of it), but it too announces the name of the visitors center (with a nice logo, I should add) with only passing reference to the name of the park buried beneath all that. 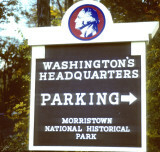 The sign at park headquarters again seems to more prominently suggest that its the HQ for Chatham Mansion than any other NPS park unit. Standard signs here would hardly be a loss of anything too significant. Other places, agreed, something more individual is required (or should remain!). I'm trying to send a picture to Rudy at rudydale@gmail.com but I'm not getting through. What do I need to do? I didn't see the US Virgin Islands National Park sign in your collection. I was just there last week and have a picture of the sign if you need it. So far I have visited 33 of the 58 National Parks in the US. Hoping to get all 58 someday! Kudos! You have masterfully portrayed in writing and visuals one of the features I would include under the heading: What's Right with America. I have a picture of Gilla Cliff Dwellings National Monuments welcome sign, instead of the historical marker you have for the sign on the website. Let me know if youd like to use it! Thank you. I'm a recently retired National Park Ranger and I've been wanting to make a collage of the entrance signs from all ten parks in which I've worked. Also want to do one for the eight in which my wife has worked. This helps me complete my collection. Great site. In addition to the parks and monuments for which you have entrance sign photos, I have photos that I took of the entrance signs for Moores Creek National Battlefield in NC and Pompeys Pillar L&C National Landmark in MT, which I will gladly send you if you would like to add them to your collection. Only after about halfway through our second trip out West did I realise how important these signs were. Since then, our trips have the signs and us together to PROVE we were there. I'm trying to locate pictures of the signs of the National Park/Monuments that we have visited and then do the cut and paste procedure but it is hard to get them to look like the real thing. Thanks for the site! thank you so much, i have been visiting parks and I want the signs to help sort my pictures!!!! Rude Dude -- I'm working on my presentation for next week and was very glad that your site exists -- the only place I could find the MACA entrance sign! I can help a little bit with the previous question about typeface. The current standard is NPS Rawlinson (see Sagamore Hill). The previous standard was Modified Clarendon (see Minute Man.) Other than that, you'd need a typeface specialist to sort them all out. Thank you. These signs are great works of art and history to this country and the wonderful National Parks Service it has created. A book should definitely be in order. Thank you so much for your time and appreciation in this subject. You are special and very much appreciated. Dear Rudy, it`s Janet! Remember me(visit you last year at Feb.)? Just wanna say Happy New Year! :) take care! Thank you so much for creating this! I googled this subject and here it is. It makes me want to create my own personal NPS entrance sign gallery. Everytime I see these signs, I feel this sense of "you have arrived" and to get ready to see beautiful sights. Thanks again! I'm interested in typography and fonts (typefaces). The topic is not addressed on this site (or maybe I've missed it?). Is there a way to identify the fonts (typefaces or typestyle names) shown on NP signage? Looking at these great signs, I notice there are many fonts used. Some look kind of art-deco-ish, some evoke the old west, some have a one-of-a-kind look, etc. Many of them seem to be favored by the signmakers, and get used over and over. It would be fun to know the font names, if they exist, and would also add to the historical aspect of this collection. I can add an image of the Virgin Islands sign, how do I add? "nothing in this policy will affect the continued use of entrance and other signs that have historic significance." So I don't think they will be changing. Wonderful!! Would make a great coffeee table book!! Thanks for compiling and posting the photos. I'm glad to share my pictures with everyone. Regarding standardization, I wrote the article for our intranet and included the verbiage about the graphics identity program and director's order. There is not, to the best of my knowledge - and I work in WASO & have a decent idea of what's going on - any effort to make all the signs look exactly, boringly, alike. This is a very cool site! I'm a retired NPS employee, and worked at three of the parks featured here, as well as several others. I'll dig into my photo collection and see if I can add a few. Thanks for a very enjoyable virtual tour of park entrances! Don't these people have anything better to do? Lets spend the money on improving something that needs upgrading and leave the signs alone. Thanks everyone for visiting, for your comments, and to those of you who sent me another 50 signs today! So many of them are simply spectacular. I'll be working tonight to add them all. Some of you have mentioned signs you have - I'd love to add them here if you'd like to send them to me, at rudydale@gmail.com. My inbox at work is fairly bursting right now! Someone should send in a pic of natural bridges sign. Good idea...bad execution. Big bulky and obtrusive, ....amazing that tax dollars would be used for such a monstrosity. I agree that the sign should reflect an image individual to the park and it's surroundings. I was also raised in the National Parks and now work with NPS and seeing the signs of my childhood bring back memories. I also get requests from visitors for pictures of our entrance signs to complete their scrapbooks of vacations past. It would be nice to use this website to help fulfill requests, however without people in them. This is a cool site, and an effective rebuttal to the generic uniformity of the "message program". Cabrillo NM has a great sign that you need to add. Entrance signs that reflect the character of the park are wonderful. Signs that look the same at every park are boring and miss a terrific opportunity to bring home the uniqueness of the park to the visitors. It is very sad to think these signs will be replaced by something that looks the same everywhere. I have grown up in and now work in Park Service. This collection of photos will give us all pride of what the Park Service has been represented. Please keep this collection going! It's amazing the diversity of NPS signs across the country. Some are obviously more welcoming and creative, whereas others are more regulatory in nature. These signs also depict the budgetary contraints of the parks themselves in that some of the signs seem to be in need of replacement. Thanks for sharing! I thinkthey are all great pics, but they would serve the National Parks better to either have folks with NPS attire or no people in the pictures at all. A great idea. As time passes, these signs will change. Future visitors to the virtual NPS home page may find this of value as we today find old snaps of value. These, as well as photos of all park signs, should be made a part of an NPS permanent collection viewable on the upcoming virtual NPS homepage.